Flat roofs have been used mostly in dry climates. These types of roofs are usually found on historical constructions in the area of American Southwest and Middle East and other areas as well where water drainage is not a big concern. These roof systems did not come into regular use in the area of North America or Europe until 19th century, when a wide variety of waterproof materials became available. This type of roof was often used in the mid 20th century architecture. Flat roofs generally have some sort of coating and a base, for which proper examination and maintenance is required on a frequent basis. Flat roof is the best example of contemporary architecture. Flat roofs are more appropriate for residential structures as compared to that of industrial or commercial, because flat roofing system will slowly become unbalanced as its size increases, and is also expensive when compared to other roofing systems. 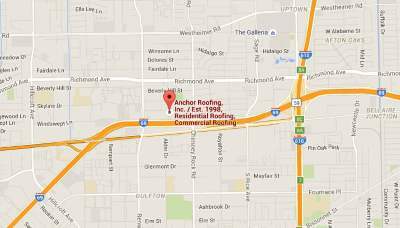 Anchor Roofing offers all possible repairs, maintenance and replacement services for both residential as well as commercial flat roofs. Continuation of roof coating that avoids degradation by the sun and provides a waterproof membrane (Mainly essential if one has a concrete flat roof). Keeping roof drains clean, hygienic and debris free, so that blockage would not prevent water from being drained, causing load of weight. Preclusion of water leakage because inadequate maintenance of flashings is the reason for flat roof leaks. If you are not sure whether your flat roof requires repair, maintenance or replacement, an Anchor Roofing representative is always ready to guide you on the exact course of action. Most of the flat roofs do best with timely frequent maintenance. Older roof types, such as gravel and tar, need regular re-application, but can survive for several years. Newer liquid membrane waterproofing systems require periodic examination/inspection for damage. If water accumulates on any flat roof, then it is advisable to remove it as soon as possible so as to keep the flat roof surface in fine condition. Examine all roofs quite a few times every year, as well as after any major storm. Flat roofs are enormously space-efficient, since they give an equivalent ceiling height for all space underneath the roof. Many flat roofs can also be used to support outdoor recreational spaces, solar panels and roof gardens. Flat roof systems that comprise a sturdy waterproofing crust and soil or other mounting media make a suitable substrate for green roofs, which support plants growing directly from the roof. Flat roofs require periodic inspection, maintenance and are prone to damage from foot traffic. Any crack or other damage in the roof’s waterproofing crust can cause a leak, making it risky to walk on your roof even to inspect it. Waterproofing systems for low-pitch and flat roofs often fail, although newer products need less maintenance as compared to that of older asphalt-based products. Contact roofing contractors Houston for re-installation of your roof.